National Records of Scotland released Scotland’s Population 2015. The figures produced by National Records of Scotland paint a picture of our nation in 2015. The Registrar General’s Annual Review has been published since 1855, and over that time my predecessors have faithfully recorded the state of our nation, and told our story – one of changes, both big and small. The population in 1855 was 2,978,065. This year’s figures show our population is still increasing, mostly due to migration, and in 2015 was at its highest ever at 5,373,000 people. The population is continuing to age and this change will bring both opportunities and challenges in the years ahead. As well as more people moving to Scotland than leaving, fewer babies were born during 2015 and there were more deaths than in 2014. The most common causes of death are still cancer, respiratory system diseases and ischaemic (coronary) heart disease. 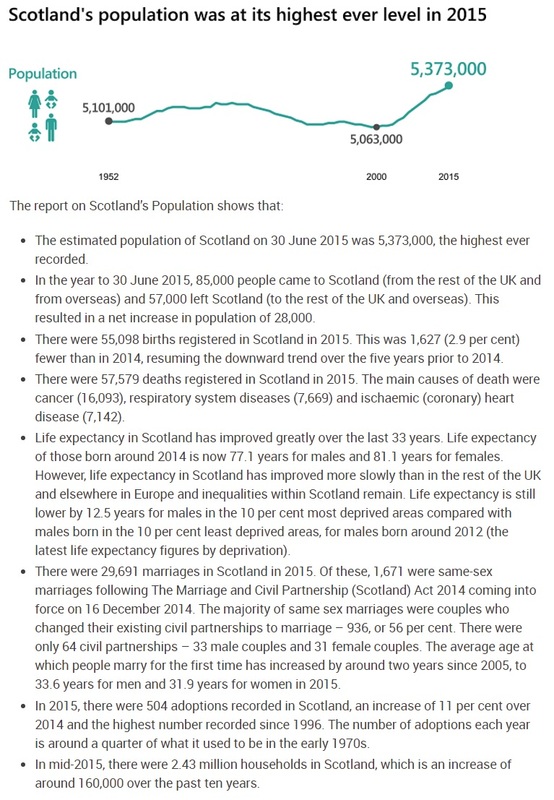 Although mortality rates in Scotland have generally fallen more slowly than in the rest of the UK and elsewhere in Europe, the improvements over the last 60 years are still considerable and the impact is reflected in the increase in expectation of life. Despite these improvements inequalities remain within Scotland. For example, males born around 2012 in the 10 per cent least deprived areas in Scotland could expect to live 12.5 years more than males born in the 10 per cent most deprived areas.